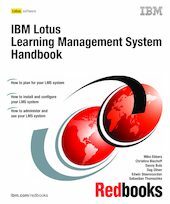 This IBM Redbooks publication introduces the new IBM Lotus Learning Management System into the growing world of eLearning products and systems. We wrote it to help you plan for, install, configure, and use the LMS to meet your company's education requirements. We begin with a discussion of what a learning management system is. We describe how this new LMS contains a WebSphere-based architecture. We list the requirements and prerequisites for supporting this eLearning environment. Then we tell you of our installation experiences, and show how to configure and customize the system for your company. Lastly, we give you some tips on how to adminster and use the LMS. We end with a case study that illustrates these points. Anyone who is reponsible for choosing and implementing a learning management system will want to read this publication.